I left my camera at home today. And, of course, something exciting happened: we had goslings among our local geese! And no photo. Note to self: ALWAYS take the camera to work! No, I didn’t paint that. It was another little artist. I merely paid for it at the Oak Lodge Garden Club plant sale, along with the other items I picked up there. I forgot to include it in that blog because it was swallowed up in the depths of my purse. 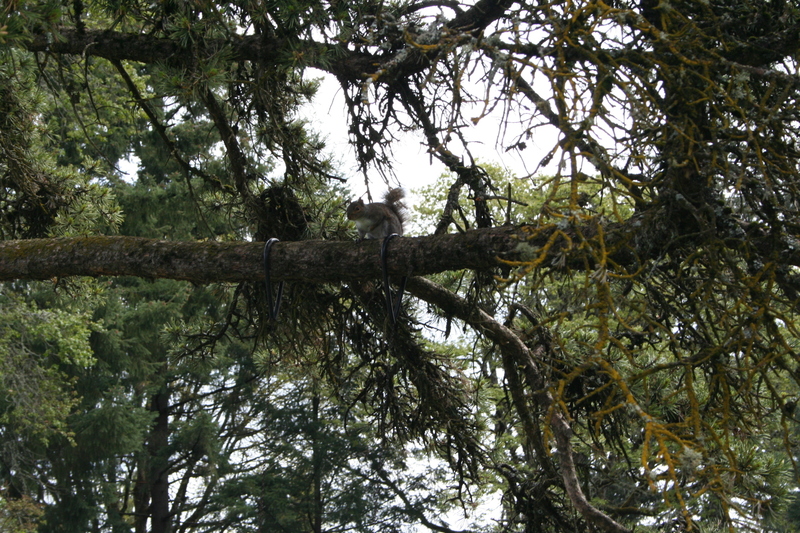 But that’s all right, because it gets to shine in its own little blog, a blog just about western gray squirrels (and the aforementioned goslings – but they don’t count because I had no camera). 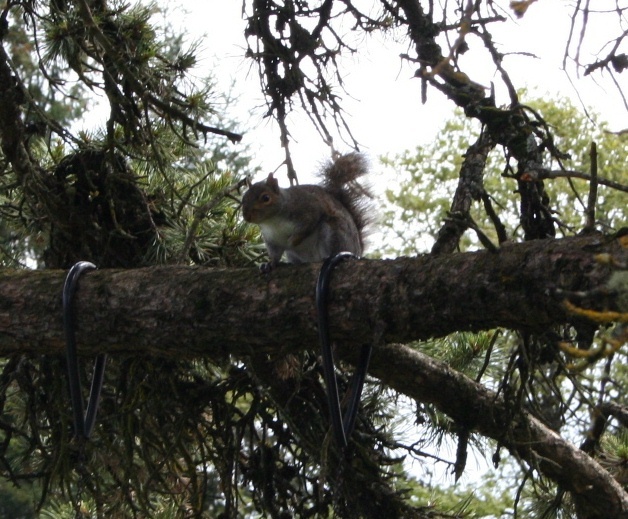 I’m blogging about the western gray squirrel today because the Squirrel Matron was back. And I feel rather stupid. There were two squirrels out in the yard: a big old Eastern Fox Squirrel in the bird feeder and the gray one down on the ground. Because I could see both squirrels at the same time, it dawned on me that the gray squirrel didn’t actually look much like the one in the bird feeder, and it wasn’t just the gray fur. It was smaller and had finer features, and it’s belly was white instead of ruddy. And the light came on (I’m slow, I tell you a truth): the gray squirrel wasn’t an old Eastern Fox Squirrel! 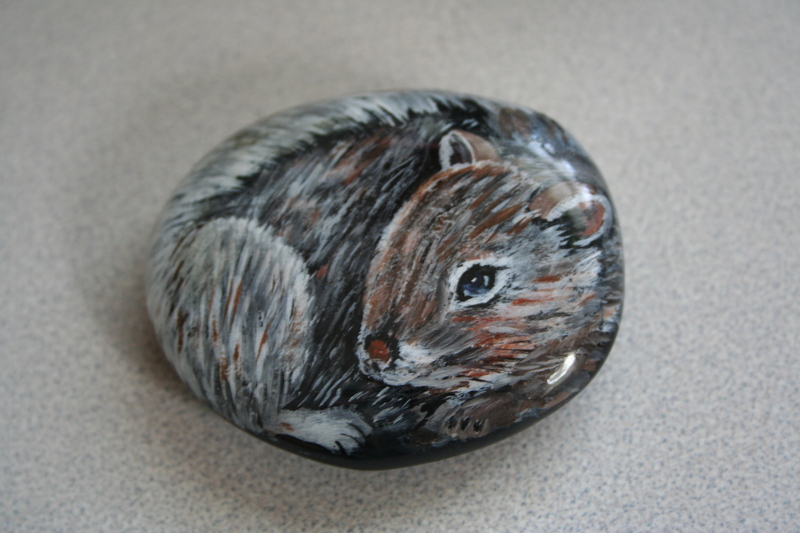 It’s a native Western Gray Squirrel! Here’s a little story: the Western Gray is considered threatened in some parts of the west. There have been several theories, and one includes the invasion of the larger, more aggressive and congenial Eastern Fox Squirrel. The new comer pushed the native squirrel out of its habitat. And, in truth, it is rare to see a Western Gray around the Portland metro area. They’re here, but they’ve been pushed into the suburbs and woodlands. As that little bit of truth came to light in my brain, the gray squirrel gave up her search for seeds on the ground and went up to the bird feeder. There she touched noses with the Eastern Fox Squirrel. I thought there might be a battle for supremacy or ownership of the feeder, so I grabbed my camera and hurried out the door. The Eastern Fox took off like a bolt of lightning and the Western Gray sat up on the limb scolding me. I’m really pleased to know that we have a Western Gray Squirrel coming to our bird feeder. Now I know why I don’t chase squirrels out of there. We’re just doing our part to keep the wildlife native.